Last week the Germans were finally on the attack, after waiting weeks for the weather to cooperate with their plans. On the first day the Germans had been cautious in their advance against shattered French opposition, on the second day they pushed harder. Along most of the front they encountered little resistance, although the French did manage to fight back in several areas. On the first day this resistance had its successes, but on the second what was left of the French front lines had fallen. And that is the point in which we will take up our narrative today. Today we will look at the third and fourth days of fighting before looking at one incident that happened on the fifth day. That incident is the fall of the mighty fortress of Douaumont, the largest and best fort in the entirety of the Verdun complex. How and why it fell is a hell of a story, and for those expecting some story of a heroic assault upon steadfast defenders, I'm afraid you may be disappointed. One thing to keep in mind today, and for the next several episodes. Is that there was generally fighting along the entirety of the Verdun front almost every day, I cannot touch on all of these actions in the podcast. The night between the 22nd and 23rd of February was brutally cold. Across the battlefield the wounded were either in constant agony, or succumbed to their wounds and the cold. The fighting and confusion of the first two day of fighting meant that the 72nd division had almost ceased to exist, and was certainly no longer a coherent fighting force. One lieutenant would signal to his commander that “The commanding officer and all company commanders have been killed. My battalion is reduced to approximately 180 men (from 600). I have neither ammunition nor food. What am I to do?” Somehow, even in their greatly reduced numbers and their isolation there were still counter attacks happening. Often these units were small, sometimes as small as half platoons who were counter attacking on their own initiative. Most of these attacks were completely futile, but I am not sure I can place much blame on the young junior officers who were often ordering them. They were following the standing French orders and also, they probably were not positive on how bad of a situation the French front was on the whole. Some of these units probably did not receive any news from anywhere other than right in front and behind them for days and might have assumed that everybody was holding the line except for their unit. One of the larger counter attacks was made by Major Bertrand who attempted to counter attack back into the Bois des Caures where Driant and his men had been destroyed. 3 Battalions were supposed to go in on the attack, but when the time came only received the proper orders before the time of the attack. With just 1 Battalion trying to attack against a numerically superior foe it turned into a disaster. Even though some counter attacks met with disappointing results the French defenders managed to hold out in several places sometimes it was a small unit, sometimes it was only a machine gun nest but they still fought on. One area of stubborn resistance was Beaumont where the remaining French troops would end up fighting almost to the last man. The French had placed machine guns in many of the buildings within the town and any German attack was fought off by these machine guns. The only way for the Germans to root them out was to literally bring the building down on top of them with large German artillery bombardments. This and other stubborn defensive actions while often ending in defeat for the French did slow the Germans down, and kept them from fully breaking through, this was a victory in and of itself when you consider the massive artillery superiority, huge manpower advantage, and general cohesion advantages that the Germans enjoyed. Another side effect of these actions was that it convinced many German commanders that they needed to slow down and reduce their attacking goals. The French were also adapting to the German tactics, this was particularly felt when it came to the German flamethrowers which initially caused French units to panic. Now, after fighting them for days the French soldiers were learning how to take advantage of the vulnerability of a man walking around the battlefield with explosive tanks of flammable liquid on his back. The French were also bringing more and more artillery fire from the west bank to bear on the Germans almost by the day. This was especially impactful near the river where, after the fall off Brabant, the German advance was greatly slowed. The Germans were also running into a problem that was not specific to the actions around Verdun, and this was how to keep moving the artillery and supplies forward over a shattered battlefield. The situation at the end of the third day of fighting was that the Germans were in command of the entire first defensive line, but it looked like maybe, just maybe, the worst was behind the French and they would start holding their ground. When the 24th of February dawned everything seemed to be going okay for the French, the to-the-last-man defenses at Beaumont and other areas of the front had bought time, the thing that the French needed most to try and stabilize. Even though in many places the French reinforcements found their way into auxiliary lines behind the front line there were still disasters to be had. In some areas entire units continued to just vanish from the map due to German attacks. Thankfully for the hard hit men of the 72nd division their tour of Verdun was almost over. They were slowly being replaced by the 27th African division that was just now coming into line. Unfortunately for the 72nd there was still one more disaster that they had to take part in before their role in our story is over and that involves a place called Samogneux. This village was held by what was left of a Battalion under the command of Lieutenant Colonel Bernard. Samogneux was right on the Meuse, so close to the river that the Germans could only attack it on 2 sides. And it was also within easy range of the French guns on the West bank, which should have been a huge benefit. However, on the night of the 23rd some French troops who had retreated through the village informed those behind the line that the village was undefended and had most likely fallen to the Germans. Rumors of this reached all the way up to the 72nd commander, General Bapst but he was simultaneously receiving messages from Bernard that he was still in the village and still defending it. For the moment Bapst ignored the rumors, but then news reached him from another source that it had fallen for sure this time and he was forced to draft orders for it to be retaken. A critical piece of this order, and really any French counter attack near the river, was coordination with the French artillery. Just after midnight on the 24th the French artillery opened up, just as Bernard was preparing to send out another message that he was still holding the village. For two hours the French guns fired for all they were worth, believing that they were dropping hell on the heads of the Germans, but they were instead French troops. Shell after shell fell, first the machine guns on the left flank were destroyed and then the Germans joined in and also fired at the village. At 3AM all of the firing ceased and the Germans moved into the town. The French artillery stopped firing while the German guns moved on to caused havoc among the French massing for their counter attack. Within an hour the village was firmly in German hands and would stay that way for some time. By continuing to call it a village might be doing a disservice to villages everywhere, with so much shelling from both sides the village had been virtually erased from the map and was instead just a few piles of rubble. During most of the fighting up to this point the French had been forced to move reinforcements forward from the 30th Corps piecemeal, almost just panic moves to keep the line holding, but now since it was time for the 72nd to leave it also gives us a great time to step back and take stock. The 30th Corps as a whole had lost 60% of its men as either dead, wounded, or missing. That is a really bad number, but not nearly as bad as the 72nd and 51st divisions within the 30th Corps had it. The normal strength of the 72nd and 51st divisions combined was around 26,000 men, during the first four days of the battle they had lost 192 officers and just over 16,000 men. 10,000 of those losses were prisoners, along with 65 artillery guns and 75 machine guns. So out of 26,000 men from those two divisions, only 10,000 remained as active infantry at the front. While this represents horrible attrition, it was not the only problem that was being dealt with by the French commanders. The French had lost their first line, their most completed set of entrenchments around Verdun. The auxiliary line barely had any work completed on it, being ordered by Castlenau in late January, the second line was little better. This meant that the 37th African division, which was now moving into the line, was walking into an impossible situation. They moved forward into a battle in progress and were asked to hold the line, but they had none of the protection that the 72nd had enjoyed during the first 3 days of the battle. There were no real trenches, very few fortified strong points, and very little cover, all having been destroyed by German artillery. This meant that when the pressure mounted on the 37th it was not long until, first in small groups, then in units, then mostly as a whole, they began to retreat. This was not an orderly fighting retreat either, it was a full on rout. It is hard not to sympathize with them though. The result of this situation was that over the course of the 24th the Germans gained almost as much ground as they had on the first 3 days combined. The Germans were only stopped when they reached the French line that was anchored on the Forts of Douaumont and Vaux. Douaumont will play its role in our story shortly, Vaux will wait though because it is at Vaux in the summer heat of June that the hell of Verdun would reach its peak. What had started out as a good day for the French had turned into a disaster due to the breaking of the 37th division, and French morale as a whole was a disaster at this point. The French artillery on the east bank had been almost completely silent throughout the battle and nothing was worse for the men than to not hear their own guns. They had also been forced from their first, then their second, positions by the German advances and artillery. Then there was also all of the French wounded that there laying all over the battlefield with no way to help them. Even those wounded who were able to get back behind the lines they were still not out of the struggle. At casualty clearing stations all along the front there were hundreds and hundreds of men awaiting evacuation. The ways in and out were nearly closed from fire so ambulances had great difficulty in trying to get in and out to bring wounded to hospitals behind the front. At the Corps command General Chretein had lost almost all of his ability to alter the situation at the front, the 37th had represented the last of his reserves, all of them, and he had nothing left to give. But thankfully it was during this turbulent time that General Balfourier arrived at the head of his troops, the 20th Corps, the Iron Corps, and he arrived at 10PM to relieve Chretein and the men of the 30th Corps. The 20th Corps was coming to the end of a long forced march, which had meant that most of their heavy equipment had been left behind and the men had very little ammunition on their persons. But they were men, and hopefully just their numbers could help stem the tide. On the German side, the evening of the 24th represented a missed opportunity. The French, before the 20th Corps arrived, were the weakest that they might ever be at Verdun. On the night of the 24th, before the reinforcements arrived, the road to Verdun was open to the Germans, but they did not have the strength to take advantage. If they had just a few more divisions of troops it may have been very different. The rest of this episode focuses around the fortress of Douaumont, which was undoubtedly the most powerful fort in the Verdun complex. It stood at the top of a hell so that no matter which direction it was approached it was imposing and seemingly impregnable. It had been sighted perfectly and there was nowhere to hide in the approach from which its guns could not find you. It had been build in 1885 but had been updated several times with the most recent modernization occurring in 1913. It was quarter of a mile wide and had enough space to hold an entire battalion of men. Around the fort was 30 solid yards of barbed wire, when a ditch that was 24 feet deep. Into these ditches were sited machine guns that could fire from both directions. There was simply no way for infantry to cross this ditch while the machine guns were still firing. The machine gun nests were connected to the main fort by underground tunnels so that reinforcements and supplies could be moved in safety. If you somehow managed to get passed this ditch the attackers would find themselves on top of the inner fort which was a glacis of thick concrete which was, again, swept by more machine guns. If the attacks then managed to somehow get to the back side of the fort, where there might be some chance of getting inside they would be met with more machine guns and a block house that should be swarming with French infantry. Oh, and of course through all of this they would be under fire from French troops around the fort and from other forts in the chain around Verdun. There was also no vulnerabilities from the guns that were firing from within the fort because they were all in retracting turrets. There was 1 turret that contained a 155mm gun, one turret that contained twin 75mm guns, 3 machine gun turrets and 4 observation domes. These could all be knocked out by a direct hit from German artillery, but even then it did not make the fort vulnerable since they would generally just get stuck in the retracted position. To defend against the expected German artillery there was 4 feet of reinforced concrete, which was on top of several feet of earth designed to absorb the impact to prevent it from affecting the next 4 feet of reinforced concrete underneath. This meant that even when the Germans brought up their 420 mm howitzers or their newer 380mm howitzers which they had used in Belgium it did not make much of a dent in the forts primary defenses. The guns could have gotten through the concrete eventually, but it would have been a slow grinding process which would have taken along time. Douaumont was, for all intents and purposes, almost impossible for the Germans to take if it was properly manned. But of course, since I said that very specific sentence and from our previous discussions of the French de-prioritization of the fortifications around Verdun, it was not properly manned. At full strength the fort could have held a battalion of troops but on the 25th of February 1916 it contained just 60 defenders. Most of the men, and most of the machine guns, had been taken out months before the battle started and at the beginning of the battle General Herr had ordered that it be prepared for demolition in case it fell into German hands. However, the French could not even get that part right because the engineer that was supposed to arrange the demolition charges was lost in route to the fort. Also, in what was another poor French decision the forts around Verdun remained under the direct command of Herr and his staff, instead of passing to the commanders of that part of the line. This would have allowed for the fort and its crew to be put under the command of the officers on the scene and greatly increased the coordination between the fort and the infantry surrounding it. This in turn would have prevented the next mistake made by the French which left the fort not only severely undermanned but also almost completely undefended from the hills surrounding it. 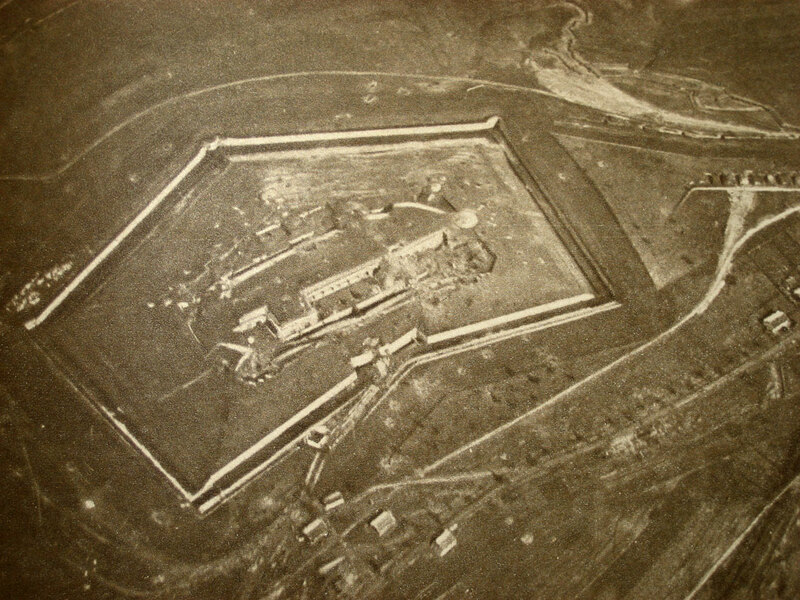 When the men of the 20th Corps moved into the line they were supposed to man the defenses on both sides of Fort Douaumont, however there was some confusion and instead of moving up to the Fort they stopped at the village which just so happened to be named Douaumont which was located several miles behind the fortress off the same name. This mistake is sort of understandable, for troops to be confused by two places with the same name while they moved into a new area since I doubt the signage on the roads had faired very well during the early days of the battle. It was not like the troops could not see the fort either, but they believed it was already well defended and they did not need to worry, which would have happened in local commanders were put in charge of defending it. It is a real shame that the defenders of the fort were done such a disservice to because up to this point it had held up perfectly against everything that the German artillery had thrown at it. There had been some damage sure, but most of that had been done to the surrounding defenses and not to the body for the fort itself. Unfortunately for the 60 men inside, while the fort was holding up it was completely vulnerable to the coming German assault, although I am not even sure you can say it was an assault because the word assault generally implies some sort of fighting and shooting, which there was very little of. While we know that the French were very weak at Douaumont the Germans did not, and because of this they stopped their attacks on the 24th about 750 yards from the fort so that they could get ready for what they assumed would be a huge effort. The men nearest Douaumont were of the 24th Brandenburg Regiment and they had encountered almost no resistance because this is one of those areas where the 27th division had almost completely broken during the attack. The 24th had actually meant to get closer to the fort but they realized that the units that were supposed to be advancing with them on their left and right were not keeping pace so they had to stop. This however did not stop 3 small groups of Germans from approaching the fort on the 25th. One of these was a small section of pioneers led by Sergeant Kunze. Kunze had decided to move forward with his 10 men because they were receiving no resistance from the French, his goal was to advance until resistance of some kind was met and then he would stop. I am sure they were bewildered when there was no resistance to them all the way up to the fort which they found themselves up against after making their way slowly through the barbed wire entanglements. The second obstacle that they encountered was a series of high spike railings which would have prevented them going any further except for the fact that they found a hole that had previously been created by German artillery. This allowed the pioneers to make their way down into the moat which, as I mentioned before, should have been a death trap but instead they found it undefended even though it was obvious to Kunze and his men where the French defenders should have been firing from. The men then lifted Kunze up into one of the embrasures into the fort, which were far off the ground, by using a human pyramid. Kunze moved around to a nearby steel door which he opened to allow his men to enter with him. They moved forward until they reached the 155mm turret which was manned by 4 men who were firing the gun, all of these men were captured by Kunze. They were then able to escape down the maze like corridors but next Kunze came upon 20 defenders all in one room and he was able to slam the metal door and lock it from the outside. He then moved on to find another French soldier who took him to the officer's mess hall. The story goes that Kunze then sat down and ate some eggs and some other food that he found, although there is some debate on whether or not this actually happened. There is even some debate about the veracity of Kunze's story once he got into the fort. However, while Kunze's actions were or were not happening another group of Germans were approaching under the command of Lieutenant Radtke. Radtke and his men had moved to the fort a little ways away from where Kunze had approached and instead of entering into the bowels of the fort Radtke instead moved over the top of the fort, managing to find their way in the back side and capturing 3 French soldiers. Right as the French were telling him that there were only 60 French defenders inside a third group of Germans arrived, this group was under the command of Captain Haupt. His group had followed just 5 minutes behind Radtke's and he found the same place where Radtke's group had made their way through the defenses and across the ditch. Radtke's group had even went to the effort of piling some nearby timbers up to make it easier to move across the ditch and the two of them met on top of Douaumont at which point Haupt, as the senior officer, took command. Knowing the importance of the fort Haupt quickly organized a defense in case of a French counter attack and soon the fort was well within German hands and also well defended. The three groups of Germans had suffered almost no casualties in what little fighting their was within the fort which is shocking because even as undermanned as the fort was it should have easily been able to defend for at least a while. However, other than the gunners in the 155mm turret, which Kunze had neutralized, most of the defenders were deep in the fort at the time of the attack because even though the 420mm guns did not do much damage to the concrete defenses the explosions still made the upper areas of the fort uncomfortable to be in. Also, you may have been wondering why the Germans were freely able to move around on top of the fort, there were other French units in forts nearby and in other defenses, should not they have been shooting? Well it was a foggy day and this made it difficult to precisely identify what was happening at the fort. Because of this most of the French observers around who could see men moving around did not think that they were German because the fort was not firing on them. The assumption was that it might just be French soldiers out on the fort trying to repair defenses. Even the German generals would write after the fact that the fall of the fort was a complete fluke and a very lucky accident for the Germans. But this happy accident would have effects far greater than just its effect on the battlefield because the capture of Douaumont would be the headline of almost all of Germany's newspapers the next day. The news of the Fort's capture began to spread up the French chain of command soon after it was in German hands. One of the first to know about it was General de Bonnaval who commanded troops near the fort. He believed that with the fort taken the positions on either side of the fort were untenable and he ordered a withdraw of all troops on the front around Douaumont. De Castelnau then received the news after he had rushed to Verdun to try and help organize the defense. The Germans wasted no time in publicizing the event, they even dropped leaflets over the lines that read "Douaumont has fallen. All will soon be over now. Don't let yourselves be killed for nothing." This, along with all of the events of the previous 4 days spread panic through the French troops at Verdun. The news would then reach the French newspapers on the 26th, the French high command would try and soften the blow by focusing on how many men the Germans must have lost in the attack on the fort. In response for comment from the press the French high command would release a statement "A bloody struggle took place around the fort of Douaumont, which is an advanced element of the ancient organization of Verdun. The position was taken in the morning by the enemy after numerous fruitless assaults, that cost very high losses and was passed by our troops, who repulsed all the attempts of the enemy to throw them back." Nothing could change the facts on the ground though, that the Germans had now advanced 10 kilometers in some areas and they had captured the crown jewel of Verdun. The city of Verdun was now officially evacuated and French hopes at Verdun reached a new low. It would take the arrival of the man who would soon become the Hero of Verdun to begin restoring those hopes. Petain was on the way, and Petain would save the day.